Pardon me while I date myself as a child of the 80's with Kermit the Frog's signature song. Despite the fact that I haven't heard it in over three decades, as I worked on this quilt, that song kept working its way into my mind. I'm okay with it, though. I'll gladly own up to my love for the Muppets! I am so pleased with the way this quilt turned out. 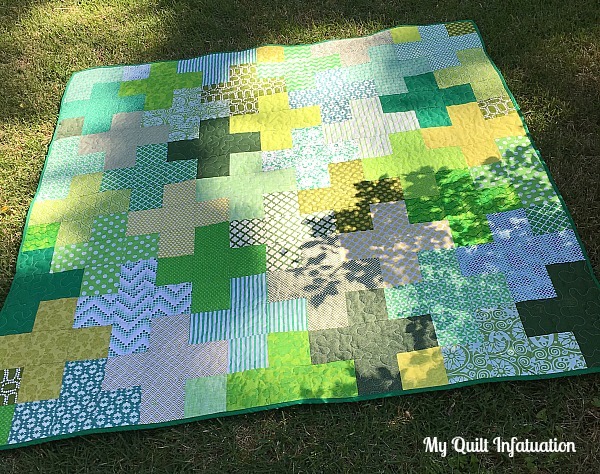 I was able to fit 34 different greens (all from stash) into this quilt, and they play so nicely all together. I love how green, depending on the specific shade, can be earthy or opulent, soothing or energizing, soft and sweet, or loud and brash. I guess lots of colors run the gamut of emotion like that, but I notice it more so with greens because they are my favorite. I just had one little hiccup in getting this one finished. Someone in my guild was destashing her thread, and I got a whole cone of Superior Threads King Tut variegated green thread. I intended to use it for piecing and quilting, and the piecing went off without a hitch, but when it came to quilting, my machine just wasn't having it. I have never used a thread stand, since I usually just use regular spools that fit my Bernina. I put the cone in a mason jar behind my machine and that worked well for piecing. Not so much for the quilting part though. It was late at night, and I couldn't get the thread to feed through my machine with correct tension for free motion. Instead of being patient (shocking, I know), I gave up and quilted it with white Aurifil instead. I was just tired of ripping quilting stitches. Even still, I do love it quilted in white. In trying to make the thread cone work, I was doing a little research and realized what a great deal the larger cones are. I had no idea! Note to self- buy a thread stand ASAP, and start taking advantage of those thread cone savings! On the back, I used up as many scraps as possible, though with 34 prints, some had to go back into my cabinet for another day. I opted for a solid green Kona Clover binding, and DID use the variegated green thread to stitch that. I honestly don't know that I love any other colors enough to make a monochromatic quilt from them (aqua/teal is probably a close second). What about you? Have you ever considered (or made) a monochromatic quilt? I did a mostly gold one once, called it Butterscotch. Just pinwheels and 4-patches. The fabrics had quite a bit of white in them and I think I alternated with white squares. A friend admired it and I gave it to her straight away since I was making it to give away anyway. Not yet, but yours has such good gradations of value that it is really interesting. I have made a black and white one, but that is it. You might like my newest Garden Maze quilt with mostly greens. How fun this quilt is! Wonderful inspiration to try a "one color" quilt! I've not done one, but I sure want to now! Nice job!! Yes, a green sampler quilt I made in the 1980s, and a purple "Go Frogs!" quilt. Oh this is beautiful! 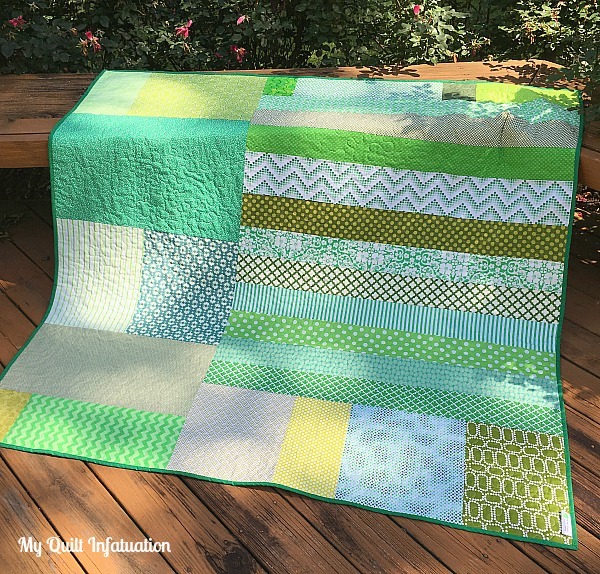 Green is my favourite colour and the Plus quilt pattern is my favourite too! If I ever made a monochromatic quilt, it would have to be this one! I never knew green could look so good. Beautiful. My color is orange and I do have quite a collection but it doesn't always play other oranges. Too warm of a color I presume, and I like coral too. Thanks for the idea of a monochromatic quilt. 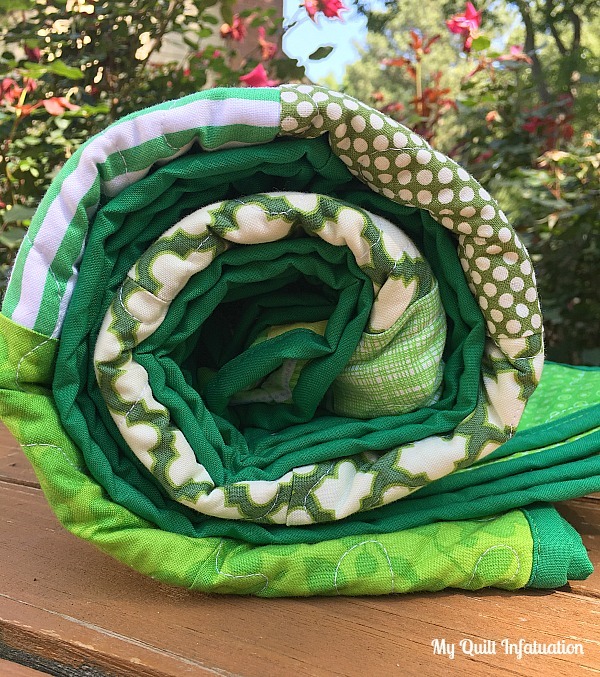 The green quilt turned out just beautiful! I have a couple of questions that I'm trying to resolve in planning a plus quilt of my own--how did you decide between using five squares or using the rectangle and two squares method? Is there any advantage to one method over the other? Also you may have already said, but I would like to know the size of square you finally settled on. I am having a hard time vuisualling how different size squares will look in a finished quilt, even though I have cut sample plus blocks out in 3-4-and 5 inch sizes. I feel too undecided to go forward!! Thanks for any answers you have. Katie S.
thanks, Katie! I actually used 5 squares in all of my plusses for the simple reason that it was easier to cut, and plan. I thought it just allowed more flexibility when it came time to lay out the quilt, and I could just move things around as I wanted, instead of having to worry about not having the right size for the edge, etc. These squares are 4 inches finished. Good luck with yours. Plus quilts are a lot of fun! Thanks Kelly! That's just the little push off my hill of indecision I needed. I'm going with 5 squares and 4 inch unfinished blocks. It's so weird how you can get stuck obsessing over a little thing like that. I'm so relieved to get on with it because I'm crazy about my fabric and think it will be a beautiful quilt (maybe loving the fabric so much has been my roadblock for fear of messing it up!! I did a scrappy Bonnie Hunter pattern in all creams as a wedding gift once. Turned out beautifully, love yours as well. Green is also my favorite color--did you know the human eye can see more shades of green than any other color in the spectrum? Maybe because so many things in nature are green. Great use of stash and a wonderful pleasing simple idea done beautifully. I don't buy cones either! 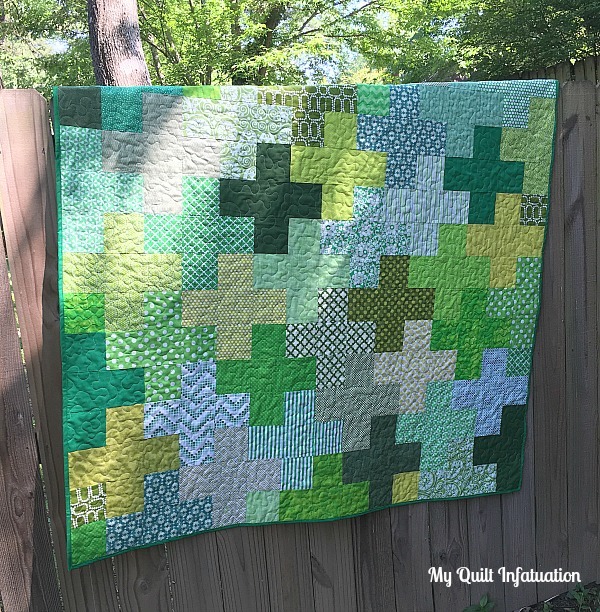 Green is my favorite color and I love how you used so many different shades in this quilt. I haven't made a monochromatic quilt but I would definitely consider it. But it's such a great song! And a great finish. Aqua/teal would be a nice version. Lovely greens. Congrats on a beautiful finish! On the thread issue, out an empty bobbin on the regular thread holder and run you thread through one of the bobbin holes and then through the threading schematic. This should give it the tension it is hunting. Bhopal this helps. Once again you inspire me! I've looked at my blue stash to see if I could pull off a monochromatic quilt of any style. I'm still trying to decide on whether I can or not. I'd like to bring the blue pile down a bit. Maybe I should think of doing red, white and blue plus quilt? Hum... thanks for the inspiration! Monochromatic quilts are near and dear to my heart. I just love them. :) I really like how you balanced both color tones and shades across the quilt top. I just realized the value of cones, too, but wonder what it would take to integrate into my machine as well. Beautiful finish! 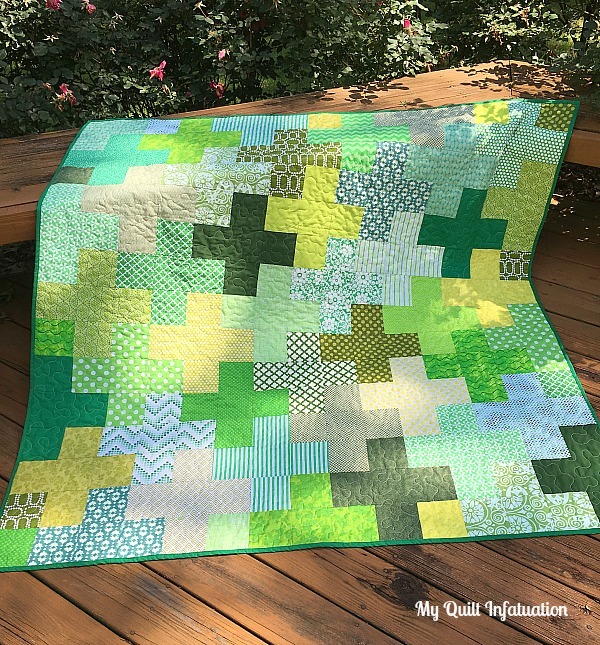 What a fun quilt, I love all the greens together! Love this one but then green is my favorite color. Funny though how no matter how much of our stash we use there's always some left.